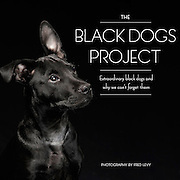 This photo series started after a conversation about how black dogs have a harder time getting adopted than other dogs. I decided to start a photo series photographing black dogs on a black background in my studio. Using social media, I recruited local dog owners who have black dogs to photograph. It's an amazing journey that will become a book in the fall of 2015.